On August 9th, Dr. Barbara Ryden from the OSU Department of Astronomy presented as part of the COSI After Dark – Time Travel program! Sigma Xi supports the COSI After Dark program by providing speakers from our membership for their events. If you are interested in serving as a speaker in future COSI After Dark events please contact Bailey Dye. On September 5th, The Ohio State Chapter of Sigma Xi and Ohio State University Libraries hosted a seminar at our monthly “Science Cafe” on the 3rd Floor of the 18th Avenue Library in the Research Commons. 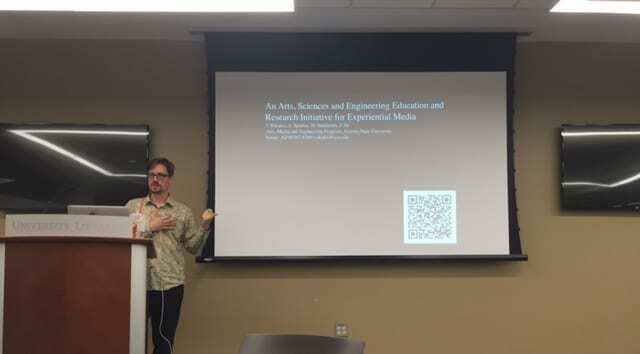 Our speaker was Dr. Alex Oliszewski, an OSU Associate Professor of Media Design gave a talk entitled: “Disciplinary Illusions: Enter the TransDisciplinary”. During his talk, Dr. Oliszewski discussed how transdisciplinary approaches and efforts are crucial to solving the worlds big problems! Posted by Bailey Dye (Education & Outreach Committee) at 5:47pm September 13, 2018 Posted in COSI - Columbus Science Museum, Science Cafe. Bookmark the permalink.